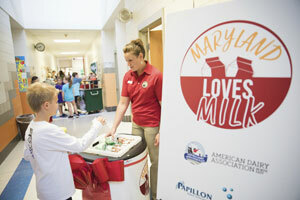 Four Maryland schools in Talbot, Cecil, Somerset and Frederick counties received barrel milk coolers as part of a partnership with American Dairy Association North East (ADA North East) and Papillon Agricultural Company and MIN-AD, Inc., two Maryland agricultural businesses that donated $2,000. Dairy farmer Trisha Knight Boyce from Easton, Talbot County, also attended the ribbon-cutting and served milk to the students. Boyce and husband Jarred milk 70 cows and operate Chapel’s Country Creamery where they make artisan raw milk cheese.